At first glance one may assume Poetry Teatime is some old fashioned, boring, homeschool Mom trend that has kids rolling their eyes faster than one can pronounce the word haiku. When I first caught on to this wonderful trend inspired by the Brave Writer lifestyle, my husband reminded me not to get my expectations too high. I do often think my ideas are much better than they play out, so it’s usually good for him to keep me grounded in my homeschool Mom fantasies. Instead it caught my littles by wild fire. In sickness and in health when Tuesday rolls around they are begging for Poetry Teatime. Much to my surprise Wild Little Girl requests poetry every day. Her attention span is usually hardly enough to last through a picture book however poetry has her captivated entirely. So, what is it about Poetry Teatime that has taken it from old fasioned and boring to trendy and appealing to our children? 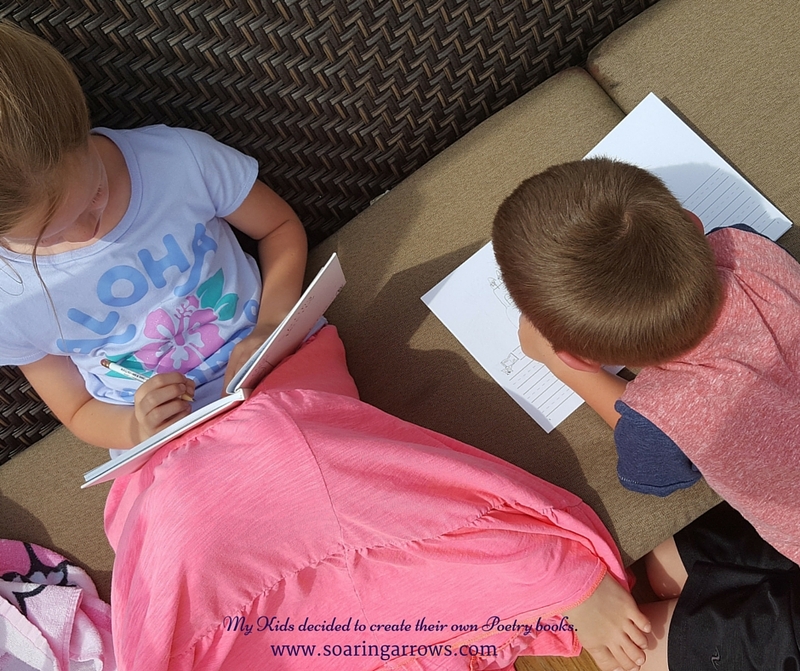 When you first began to imagine what your homeschool atmosphere would look like I am willing to bet you thought more of your day would be spent in lovely moments with your children. Some of us do have these lovely moments but many of us know there is some magic missing from our homeschool week. Poetry teatime adds an endearing quality to our time spent learning! In the middle of what can become a tedious schedule we take a quick break for tea and poetry. So what gives Poetry Teatime this endearing quality for kids? The language and sound of poetry being read is absolutely lovely. Amidst the copywork, math worksheets and reading practice my littles have absolutely thrived on this break from our usual schoolwork. Sometimes we take the beauty a step further by bringing our poetry out into nature to enjoy with the sunshine or we bring nature inside with a bouquet of flowers as our centerpiece. Or by turning a poem into a work of art, the child’s version of course, not Mom’s interpretation. Beauty is a requirement for a pleasant poetry teatime! How often do our homeschooled littles get the delightful surprise of a tray of snacks and something delicious to drink in the middle of the afternoon? Well I’ll tell you for us, about never until we started this weekly tradition. Now one afternoon a week my kids know they are going to get one thing all kids look forward to, Mom serving them up a plate of cookies, cakes, cheese and crackers, or fruit. The drinks don’t have to be tea! Sometimes we have lemonade or hot chocolate instead. Either way it’s all served to kids with smiles on their beautiful faces. There are no grades during poetry teatime. All are included and the interpretations are welcome from the small to the tall. Often they will pick thoughts out of these beautiful poems that I fail to see. The readers can read poems aloud and the smallest ones can choose which poems to be read. Everyone has an important part to play and no one is left behind. In fact I am sure that is why Wild Little Girl loves poetry teatime so much. She is the Preschooler right now and this is the moment each week she feels like one of the big kids. I love seeing her eyes shine as she chimes in with her own big thoughts and ideas. Mama put down all your To Do’s and Type A parent drama. This is a time to relax and enjoy with your kids. DO NOT and I repeat DO NOT think during this time of the school you aren’t getting to in that moment. You can give your kids 20 quality minutes during this time to laugh, enjoy, be silly and eat a few cookies without sweating the calories. Let the crumbs drop all over the floor and clean up later. Let them make up their own gibberish, kid poetry if the creative mood strikes. You will be your kids hero for this, I promise you. Obviously we need some good, quality Poetry books for Poetry teatime! Before thinking you have to spend a lot of money, consider trying some books from the library before you start making a huge investment in new books. See what you like! Many of our favorite Poetry books are a part of our Sonlight curriculum, each year we get to add new Poetry to our beloved collection! If you haven’t added Poetry teatime to your weekly routine, I dare you to try! It has breathed new joy into our school weeks and my kids even requested we keep it going all Summer long. This isn’t just for families who homeschool either! Give it a try as your kids come home from school and just see if they don’t start looking forward to it. After all who would complain? A comforting plate of cookies or cake. Let’s curl with some Poetry a while. Now check out our list of favorite poetry teatime reads! That is such a beautiful idea. We love books, poetry and I am a crazed anglophile. I think my girls would love this as part of their routine and I certainly would. Lovely photo collage. I had to look up anglophile but yes, I am absolutely the same! I love all things English which is probably due to my English heritage. My maiden name is Sherwood! Not sure if you have checked out any of Leah Boden’s scopes on Periscope but she is from England and I love just hearing her talk about homeschooling and Charlotte Mason! I hope you enjoy your Poetry Teatime! I’ve not heard of Leah Boden, thank you. I will check her out. 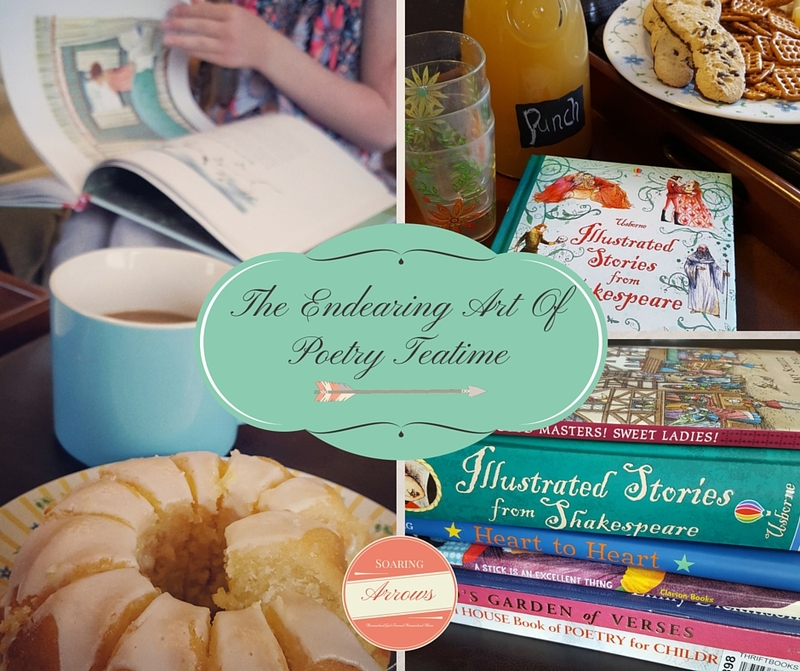 Summer is a wonderful time to add Poetry teatime! We especially love when we can read it outside on good weather days. I hope you enjoy it! Ok… Ok! I will do poetry tea time. Everyone has sold me on it. =) Beautiful post! Pingback: Homeschooling with a Routine Instead of a Schedule - Here's How!